I’m definitely not someone who reads “pop psych” or “psycho babble” (short monikers for popular psychology, the easily digestible version of scholarly psychological findings), which is how some books on habits, speed reading, speed writing, etc. are categorized. I don’t read self-help books because I think I need them, but because they’re fun reading material, particularly if they relate to routines and systematic repetitions. Because I am a neoinstitutional theorist, rules, norms, habits, routines all lead to the formation of institutions. Thus, my interest in habits. I was raised with military discipline because my grandparents were in the military. I also love finding new ways to do things that will make my life easier. 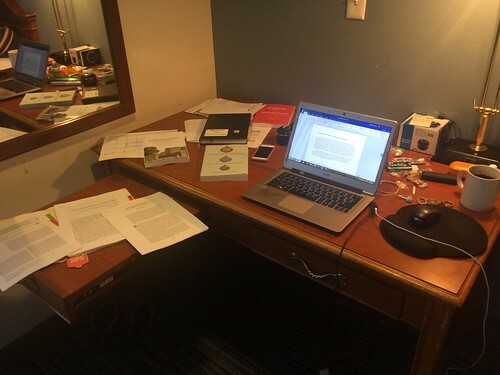 I wake up at 4 in the morning to write because that’s a habit that I picked up as I made the transition from graduate student to professor and it has given me excellent results in terms of productivity and time spent doing things I love. I have my own “Start Your Day Right” strategies, I spend the first two hours of the day either writing or researching, and I rely on good habits to allow me to break through my lack of focus or writer’s block. However, many of the good habits I picked up, I did so by learning from others and absorbing their robust working practices. I am very mimetic. I adopt habits that other people have demonstrated are solid, and this is something I did as I grew up. I developed the habit of reading books about habits. In addition to Duhigg’s book, I also picked up Gretchen Rubin’s Better Than Before, which really helped with finding strategies to build my habits. Since Dr. Andrea Collins and I have very similar interests in academic productivity strategies, I followed her advice and bought Gretchen Rubin’s “Better than Before”. I also must confess that I did so on the cheap. I got a lot of these self-help books for less than 15 US dollars, and I received them on the week I planned to take a few days off. Since I love reading when I’m on holidays, I got myself about 10 books that I can read over a weekend. Rubin’s Better than Before was one of those 10. I think part of what makes Gretchen Rubin’s writing so easy to access is 1) she presents ideas I’ve long believed in 2) I know myself well. I have spent decades analyzing myself and my behaviour, even since I was a child, therefore I know what I like, I know what I don’t like, what I can and cannot do, what I am willing to do and what I am unwilling to do. I know which things will motivate me and what will de-motivate me. I’m a morning person who loves starting new projects and writing new text. I hate editing and sometimes I struggle to finish something because I’m a bit (or a lot of) a perfectionist. One area where the broad-strokes categories that Rubin suggests fail is that you can be something for some areas of your life, since we are all heterogeneous human beings with very different facets of our lives. or example, I’m an Under-Spender for EVERYTHING *except* for books and stationery/office supplies. I save money in everything, but I am a sucker for printed texts and I love, love, love buying new pens, paper, notebooks, highlighters. I KNOW this. I know I am an Under-Spender except for very specific things and therefore, I budget accordingly. While I agreed with much of Rubin’s texts, there were some major points of disagreement. I did love, however, Rubin’s strategies to make something LESS appealing. In the end, as I said on Twitter, Gretchen Rubin’s Better than Before could possibly be (and maybe it is) better than Charles Duggin’s The Power of Habit. Both are very solid books and I would recommend both, with the provisos I made explicit in these reading notes. Tagged with books, habits, reading notes.